The former vice president still owes Clarence Thomas an apology. How has Chinese jurisprudential culture performed for women over history? How about Indian jurisprudential culture? Or Russian jurisprudential culture? Or sub-Saharan African jurisprudential culture? How has Islamic jurisprudential culture worked out for women? The “English jurisprudential culture” of New Zealand was the first to grant all women the right to vote in 1893, followed over the next decades by an array of other English and formerly English colonies. Saudi Arabia granted women that same right only in 2011. Then again, the women of 1893 “English jurisprudential culture”—voting rights or not—were already leading freer and safer lives than most of the women who have to function under the deeply illiberal legal cultures of the Islamic world today. Those who demand acts of contrition over “English jurisprudential culture,” seem to have a problem with ideals of blind justice and due process that stop us from sacrificing people to the whims of an aggrieved mob. 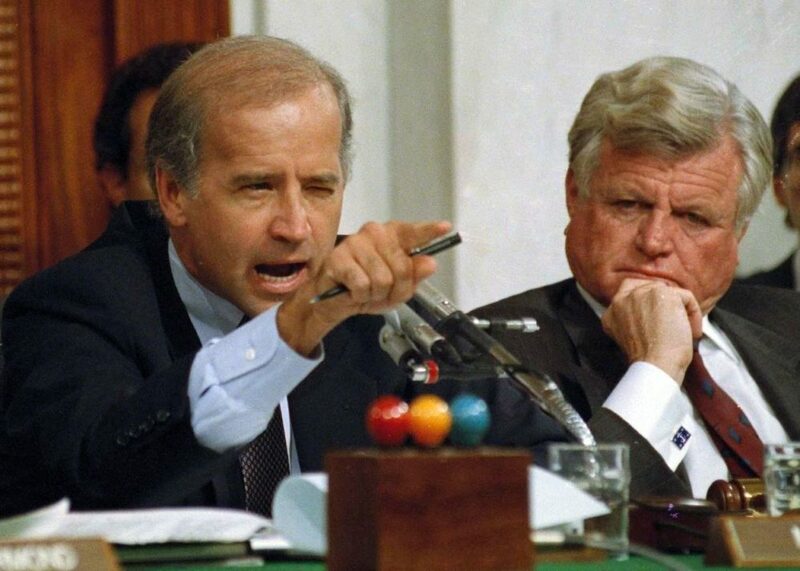 Biden’s transgression against progressivism, as far as I can tell, was affirming to Thomas during the Hill hearings that, “from the beginning and at this moment, until the end, the presumption [of innocence] is with you.” It wasn’t true. If anything, Biden should be apologizing to Thomas. What did Hill deserve? In an English jurisprudential culture, Hill was free to make her accusations against the powerful nominee of the Supreme Court in front of the entire nation. Hill was able to tell her story to a free press that took her side. She was free to write a books laying out her positions and story. Her allies were free to produce revisionist films casting her as a hero and a victim. Unlike the accusation against Kavanaugh, Hill’s allegations of sexual harassment were potentially a criminal matter. And in that regard, Hill wasn’t a credible accuser. Not a single person came forward to substantiate that Thomas, who had hundreds of subordinates under him over his years of working in government, had ever acted in the ways described by Hill towards anyone else. Twelve former female colleagues of Thomas and Hill signed an affidavit supporting him. Not one person who worked with both came forward to vouch for Hill. The FBI investigated Hill’s claim against Thomas—though she was always reluctant to cooperate—and not only did it fail to find any evidence to back her claims, but after the hearings, agents sent additional affidavits to the Senate accusing Hill of misleading the public by skipping portions of her story and offering public testimony that contradicted what she had told law enforcement officials.